Detroit: Become Human is the latest game from developer and Quantic Dream studio head David Cage, whose previous games include Fahrenheit, Heavy Rain, and Beyond: Two Souls. Its story centers around three androids—Kara, a recently repaired house android tasked with taking care of a young girl; Markus, the personal android of an aging artist; and Connor, an android investigator sent by CyberLife—and the roles they play in the growing concerns about what constitutes being human and whether or not androids should have the same rights as humans. Much like its predecessors, Detroit maintains Cage’s trademark “interactive cinematic” gameplay style, making it feel more like a movie whose outcome you decide rather than a video game you fully control. This style of game may not be for everyone, but if you have played any of Cage’s previous games, or similar titles like Until Dawn, you know more or less what you are getting yourself into. Lots of button prompts, dialogue, and decisions that need to be made that may or may not come to ruin your entire playthrough by the time you are done with the game. The story takes place over 32 chapters, and each one puts you in the shoes of either Kara, Markus, or Connor. As each chapter progresses, you will be tasked with making various choices based on your character. Where will you seek shelter from the rain and cold? How will you interrogate an android captured by the police as part of a murder investigation? As an android, how will you choose to express yourself when given a chance to paint? Sometimes these decisions can lead to little things like extra dialogue options or branching story paths, but sometimes the outcomes can be very game changing, like a character death. After each chapter ends, you see all the different paths that you could have taken and the percentage of players who made similar decisions to yours. On one hand this gives you an incentive to go back and replay them to see all the possible outcomes, but on the other hand it basically ensures future playthroughs cannot be organic. Upon its release earlier this year, Detroit gained attention for the sensitive subject matter of its central story. The game draws heavily on both historical and current tension of various civil-rights movements to craft its narrative about a group of androids struggling for equality in a world that sees them as lower-class citizens and nothing more than servants made to aid humanity. 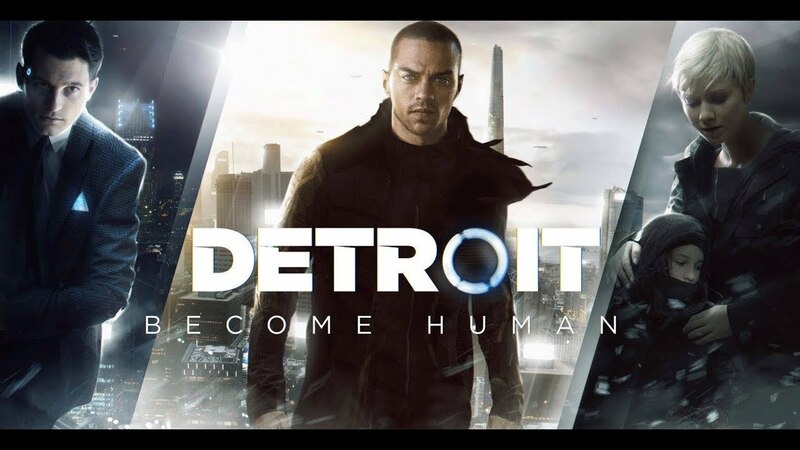 The biggest issue with subject matter such as this is that Detroit is not subtle at all in its portrayal of the similarities between the struggles of the androids in the game and the struggles of those real-life groups it draws inspiration from. Despite its narrative shortcomings, however, one of the places Detroit really shines is with its cast of characters. From its main protagonists to side characters to NPCs, each character in the game is not only painstakingly animated but given their own unique personality. Even the loading screen sees you welcomed by an animated AI named Chloe who will comment on your progress, remark at how long it’s been since you last played, and even give you a survey to immerse you in the world of Detroit even more. I downloaded Detroit with the intention of playing it with my wife, swapping the controller back and forth between chapters and making decisions we both felt were in the best interests of our characters. Choosing to play this way made it a far more entertaining and emotional experience. We were able to personally connect with each character (except maybe Markus), and were equally ecstatic when something we did worked out to everyone’s benefit and heartbreakingly devastated when something we did led to failure or character death. Above all else, we vowed to protect Connor at all costs. If you heard about everything surrounding Detroit and its heavy-handed attempts at tackling sensitive subject matter, or if you played Heavy Rain or any of David Cage’s previous games and decided the style wasn’t for you, I highly recommend you give it a second chance. You may not find yourself as emotionally invested as my wife and I did, but it contains just enough new and/or interesting additions to the interactive movie genre to be worth your time. Detroit: Become Human was released on May 25, 2018, exclusively for the PlayStation 4.